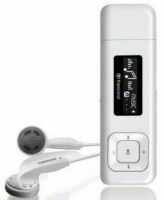 Transcend TS8GMP330W MP330 White 8Gb digital music and FM radio player with slide-out usb connector - work as usb flash drive or voice recorder, with 1" Mono OLED display, built-in MiC + 3.5mm line-in for voice/audio/radio recording, 85x25.5x11.5mm / 25g compact size, with earphone + neck lanyard + detachable sport clip. Copyright © 2019 ComXpert International CC - COPYING IS ONLY ALLOWED FOR THE PURPOSE OF SENDING US ENQUIRIES. E&OE. If you need a stylish value-added music player for all occasions, look no further than the MP330. Featuring a compact size and a convenient built-in USB connector, the MP330 is a perfect combination of a digital music player and a portable storage device, which boasts an impressive collection of useful functions. Supports MP3, WMA,and WAV(IMA_ADPCM) music files. Vivid all-white OLED screen displays clear text at any angle and in any light. Recordable FM Radio with 20 station presets. Built-in microphone and direct Line-In recording (for CD players, or other devices). A-B repeat allows continuous replay of a designated section of a track. Supports 13 languages including menus, song/album title, artist name and lyrics. USB flash drive capabilities for data transfer and storage. Power-saving screen savers and auto-shutoff function. 8 Equalizer effects, including a customizable USER EQ setting. Internal Li-polymer battery provides upto 12 hours of continuous music playback. Built-in USB 2.0 connector for easy computer connectivity and fast file transfers. Note *1 megabyte (MB) = 1 million bytes; 1 gigabyte (GB) = 1 billion bytes. Some of the listed capacity is used for formatting and other functions and thus is not available for data storage. **Max. playback time achieved with screen saver is enabled and “Lyrics Sync”is disabled. , ©2012 ComXpert International CC Copyright © 2019 ComXpert International CC - COPYING IS ONLY ALLOWED FOR THE PURPOSE OF SENDING US ENQUIRIES. E&OE. The best price and guaranteed service and backup from official computer suppliers in South Africa for the MP-T330W8G Transcend TS8GMP330W MP330 White 8Gb digital music and FM radio player. Find related MP-T330W8G Transcend TS8GMP330W MP330 White 8Gb digital music and FM radio player products in our MP3 WMA audio players Category for even more options. Read reviews and find out about MP-T330W8G Transcend TS8GMP330W MP330 White 8Gb digital music and FM radio player. Discounts, specials and cheap prices only at ComX Computers.